A Post about Knitting, Twitter and…Budweiser? When I saw this story I almost couldn’t believe it because it just sounds a little crazy. 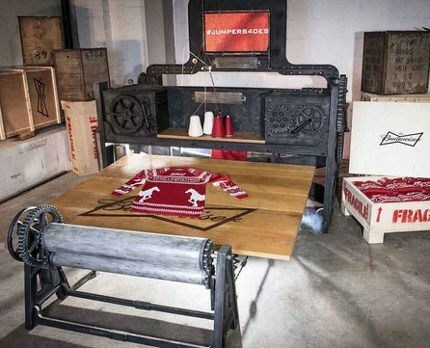 I mean, I have no idea at all how Jennifer Anton, Budweiser UK’s marketing manager, came up with the idea for the beer company to devise a knitting machine that would run on people’s tweets that include a special hashtag (#jumper4des, I know you want to know). Just that is kind of crazy enough. But the sweaters the machine makes feature horses, of course, as well as more traditional snowflake motifs, and the words “Celebrate Responsibly.” Because this campaign is really all about getting people to avoid drinking and driving. With Christmas jumpers knit by a robot. It’s still kind of cool, I guess, and if you want one of the sweaters — which will be knit through Dec. 6 — you can enter for a chance to win one on the Budweiser UK Facebook page. Maybe while people are on Twitter they should be reminded to celebrate responsibly by not drinking and texting, too. Drinking and knitting? That can be dangerous, too, but in a completely different way. When is Knitting Going to Stop Being a Joke?